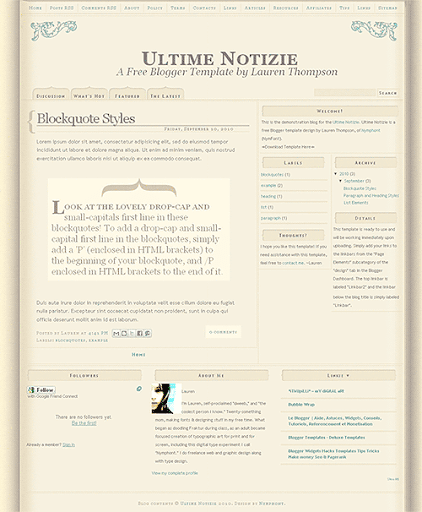 I enjoyed making Ultime Notizie, my latest Blogger template design, and I am very happy with how it turned out. I added some special features to this template, including not one but two optional and customizable linkbars, one of which featuring a no-flicker all CSS image rollover. 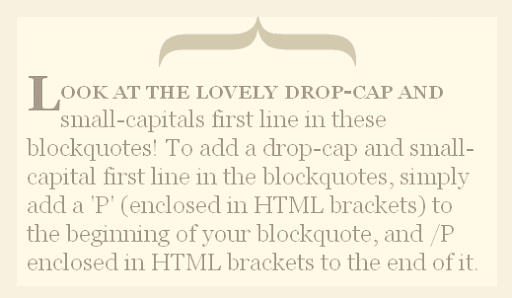 And also the super fancy blockquotes with a drop cap. As usual, the fonts and colors of the template may be customized using the Blogger Dashboard's "Template Designer," within the "Advanced," subcategory should you like to add a little pink to the template, or any other color for that matter! 2 Optional and customizable linkbars. Super easy to use and customize, details below. Images included, you do not need to upload the images to your own server, they are stored in my photobucket.com account which allows generous direct linking bandwidth. However, users who have access to an image host are advised to download the images and upload them to their own server, as the bandwidth could potentially be exceeded in the future. Download the images from here. Templates are free to use in Blogger blogs, however, the link back to http://www.nymFont.com (usually located in the bottom footer) must not be removed. Do not redistribute this template for paid download. Do not add your own links to the template code and redistribute. Modifications to the template are allowed either through the Blogger Dashboard or directly in the code, however, the link back to Nymphont/NymFont (http://www.nymFont.com) still must remain intact and again, not be removed, thank you. Do not add your own links to the template code and re-distribute. If you are going to redistribute the template, you are not permitted to add your own links to the template. This is non-negotiable. If you want to share or redistribute my templates, this is how it must be done. If you don't want to abide these terms, then you don't want to share or redistribute my templates. The top linkbar is labled "Linkbar2" and can be easily customized to include your own links via the "Page Elements" subcategory of the Design tab within the Blogger Dashboard. The main linkbar (labled simply 'Linkbar') featuring the no-flick all CSS image rollover can be modified the same way. If you do not want to use either linkbar, simply leave the widget empty. Blockquotes will display normally without this, it is not required, just an option. If you do have access to your own image host, you might want to host the images at your own server. To do so download the images here and replace image URL's in the code with the corresponding URL's at your server. I would love to hear your thoughts on this template, the more feedback I receive the better my templates can be! Thanks so much :) If you need any assistance with this template, feel free to leave a comment below. I hope you like it!